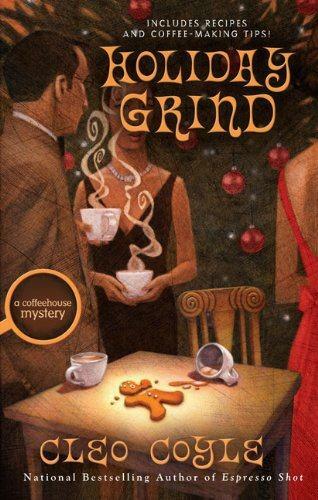 In the charming eighth coffeehouse mystery from the pseudonymous Coyle (the husband-wife writing team of Marc Cerasini and Alice Alfonsi), Clare Cosi, owner of the Village Blend, is preoccupied with creating flavorful and memorable drinks for the upcoming holiday season. Then one snowy December day, Clare discovers a beloved customer, Alf Glockner, shot to death in a nearby alley. Doubtful of the police conclusion that Alf, a part-time comedian who was working as a charity Santa, was the victim of a random murder, Clare sets out to find out what really happened. To her peril, she must do so on her own because her boyfriend, NYPD Det. Mike Quinn, is busy with his own homicide investigation. This light cozy will keep readers guessing until the end, while the drink and accompanying treat recipes will send anyone to the kitchen in search of a candy cane brownie and a caffe mocha latte.